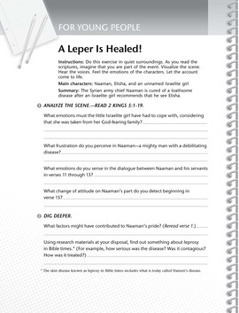 Learn from the Bible account of how an Israelite girl helped a Syrian army chief to be healed. Download the activity, read the Bible story, and let the account come to life! What can you learn from the way Nathan approached David to offer correction? Do this exercise, and visualize the Bible account of David and Bath-sheba. What lessons can we learn? Read the Bible story to see how you can improve the quality of your prayers.